All photos by Lena Nozizwe. Hear her accompanying radio report here. 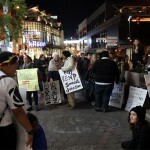 Demonstrators getting ready to protest at the Third Street Promenade and Santa Monica Place in Santa Monica. 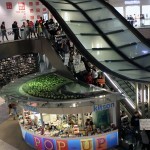 Protesters at Santa Monica Place demonstrated on all three levels of the upscale mall. 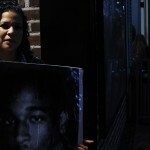 Professor Melina Abdullah holds a poster of Ezell Ford near diners at the Third Street Promenade. Ford was killed by Los Angeles police two days after Michael Brown was shot by Darren Wilson in Ferguson, Missouri. 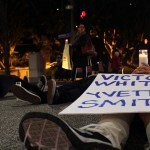 Protesters die-in at an intersection near Santa Monica’s Third Street Promenade. 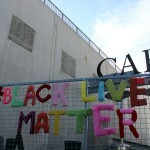 The knit graffiti group Yarn Bombing LA tagged the Craft and Folk Art Museum, located along Museum Row in Los Angeles, with the message Black Lives Matter. 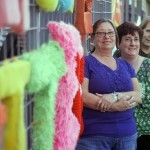 Yarn Bombing LA organizers Judy Richards, Julie Kornblum and Darlyn Susan Yee stand in front of the Black Lives Matter knit grafitti at the Craft and Folk Art Museum. 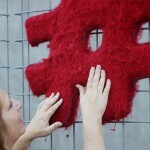 Fabric artist and Yarn Bombing LA organizer Darlyn Susan Yee, pets the hashtag of the Black Lives Matter yarn bomb.